When editing a page or post, The Editor section describes the area of the interface where you will make your text, image, and other media changes. Let’s start by adding text to the editor so we can manipulate it. Bold – This will make your text bold. Italics – Italics will make your text slightly crooked. Unordered List – Will organize your points into a bulleted list. Ordered List – Will organize your points in a numbered list starting from 1. Horizontal Rule – Adds a line across the page that will divide your content. Quote – The block Quote will push your content over, from the left. 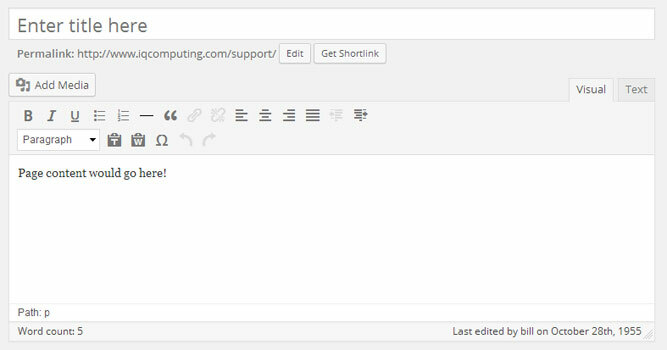 Link – Adds a link to the page which can be external or internal. Break Link – Removes the link around text. Align Left – This will left align your text onto the page. Align Center – This will center align your text onto the page. Align Right – This will right align your text onto the page. Justify – This will add equal space between words so that it fills the entire page equally. Indent Left – Mostly used for lists, this will unindent a previously indented item. For example you could use this to convert a sub-bullet to a main bullet. Indent Right– Mostly used for lists, this will indent an item. For example you could use this to convert a main bullet to a sub-bullet. Formatting Selection List – This is a list of tags readily available for WordPress. You can select a tag and the follow text will be displayed as so. Address is used to display addresses which shows italicized. Preformatted will show as Monospaced text and different than your normal font. Mostly used to show order numbers or programming code. Heading 1 is going to be the biggest bold title of your page. Header 2 – 6 is the exact same as Heading 1 except they gradually get smaller. Paste Text – This is used to paste in any text to your content. This strips all formatting and styles such as Bold, Italics, Underline, and Lists. Paste Word – This is used to paste in content from Microsoft Word. This will keep formatting unlike Paste Text. Character Map – Used to find special characters such as ampersand, tilde, copyright, trademark, and much more. Undo – Will undo a previous change. If you didn’t mean to delete that word Undo will place it back in. Redo and Undo are both reset as soon as you leave the page or close your browser. If you need to revert back to a previous change after the page has been close, you’ll be able to access the revisions. For those familiar with Shortcuts, The Editor also has them–though limited. Below is a list of shortcuts you can use.